Our 10 inch Microfiber Bonnets are designed for 10 inch random orbital buffers, like those by Craftsman, Carrand, and Titan. Just like our smaller bonnets, these are made of high quality microfiber that whisks away wax without scratching. 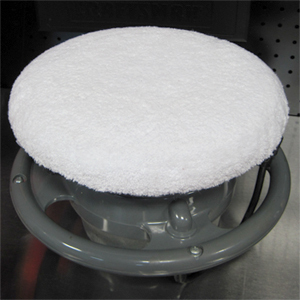 Heavy duty elastic holds each microfiber bonnet in place on your orbital polisher. Each bonnet is made of the softest blend of microfiber available! Strong, durable polyester makes up 70 percent while soft, silky polyamide makes up the other 30 percent. Incredibly small fibers are woven together in a split weave that is softer, thicker, and plusher than flat weave microfibers. Plus, microfiber stays soft over countless uses! After applying a polish or wax as directed, put a 10 inch Microfiber Bonnet over a clean foam or wool pad. Work at a slow speed and buff the paint side to side and then up and down until all residue is removed. If desired, you can use the second bonnet to do a final dry buffing. Our 10 inch Microfiber Bonnets reversible, reusable and machine-washable. Wash used bonnets in BLACKFIRE Microfiber Cleaner & Restorer with your other microfiber towels. Avoid fabric softener. Dry on low heat or hang to dry. Microfiber Bonnets make it easy to achieve a deep gloss with your 10 inch random orbital polisher! Microfiber Bonnets come 2 in each package. Bonnets are thick and soft and fit firmly on the polisher foam pad.